Bourgeois history is typified by its appreciation of particulars. In turn it rejects larger narratives regarding fundamental social relations. The effect of this is obscuring unflattering trends in the history of the capitalist world-system and particular dominant countries therein. Though highly accessible, Scott Reynolds Nelson’s Steel Drivin’ Man: John Henry: The Untold Story of an American Legend adds speculation to the fold. A central thesis of Nelson’s is that the musical tradition of John Henry has its origins in a real man. Nelson postulates that the origins of the John Henry tale lies with its cautionary and mournful aspects, such as the larger context of employment of “freed” black convict laborers during the US’ post-Civil War industrial boom. In the process, he fails to connect the more obvious and incriminating dots with an endless series of historical anecdotes; glossing over larger trends of colonization and exploitation of captive and oppressed people, extermination of indigenous peoples and the wholesale conquest and settlement of their lands, and the militaristic and reactionary nationalist tendencies which developed in that period of US history. Despite Nelson’s larger failings, Steel Drivin’ Man is nonetheless an interesting exposition on his own work. Nelson’s narrative of John Henry is weaved together with his own journey in piecing this story together. The reader is taken along as the author travels the interstate next to the Chesapeake and Ohio railroad track, forages junk roads, enters closed railroad tunnels, delves into university archives, browses the web, and visits small towns to interview older residents. Additionally, while analyzing different versions of songs about John Henry, Nelson brings his own expertise regarding the construction of the railroad into the mix. Speculative connections over John Henry’s real-life origins tie Nelson’s initial narrative together and give it some degree of efficacy. Despite being convinced that John Henry was a real person, a convict from New Jersey who was leased out to work as a tunneler on the construction of the Ohio and Chesapeake railroad and died during Reconstruction, Nelson shies from making a frank assessment regarding the role of white supremacy both before and after the Civil War. (Chap. 3, 4) Notions such as colonization and exploitation barely register for Nelson, who is largely unable to articulate a much more critical history than the southern and industrial historians he find himself skeptical of. (p. 23) In constructing his story of John Henry, Nelson fails to point to the obvious: the preeminent use of captive black labor in the economic development and sustenance of the US both before and after the Civil War. Before the Civil War, blacks were privately bought and sold by whites and used for labor. Following the Civil War, they were criminalized and arrested en masse, then contracted out as a labor force, or terrorized into working as tenant farmers for their former white masters. While Nelson is quick to gloss over the obvious narrative surrounding black rail workers during the period (that of continuing subjugation to white dominance), he is quick to speculate that John Henry was one of these workers. This seems plausible, and Nelson does much to provide a convincing argument, but it is neither provable nor significant. In some regards, his whole project seems haphazard. One can imagine future historians of similar persuasions engaging in similar work: investigating if perhaps the James Bond character might not represent a real life person originating in the late 20th century, for example. This obsession of speculating at the micro-level, typical of bourgeois historians, is matched by his disinterest in the larger developmental context that the ballad of John Henry, whether based on a real person or not, likely represents. In spite of this, Nelson brings enough awareness to the table to dispel the idea that John Henry was a heroic figure. Instead, Nelson argues that songs about John Henry were often work songs that set the pace for the rhythmic tunneling work, the content of which related complaints and cautionary advise. For Nelson, songs about John Henry originated in conditions of hardship not joy. (p. 32) Overtime, Nelson argues, the meaning of the songs have changed via different interpretation. (p. 35, Chap 7, 8) Yet they still offer clues in the past lives of railroad workers during the time John Henry supposedly lived. Perhaps the most interesting portion of Steel Drivn’ Man is the final chapter, in which Nelson describes John Henry as a “Communist Strongman” and states that “after radicals had seized upon John Henry during the Depression, his iconic status had been assured.” (p. 166) According to Nelson, musicians like Pete Seeger and artists like Frank W. Long and Jack Kirby immortalized John Henry as the man of strength with whom we are most familiar today. Nelson’s exposition of Communist politics of the period is superficial and largely in lockstep with mainstream US historiography and liberal nostalgia. He places the COMINTERN’s declaration on blacks as an oppressed nation in quotations, implying it was somehow a more convoluted notion at the time than “race.” (p. 146) He has a one-liner noting “Stalin’s reign of terror,” which is typical of bourgeois history, without once pausing to reflect on or call out the terror inflicted upon blacks in the south, Mexicans in the southwest, and Natives across the continent. (Ibid.) Nelson’s understanding of the so-called Communist role in promoting John Henry reflects his uncritical view of Amerikan society. The COMINTERN, at the behest of Stalin and Harry Haywood, did impose on the US party the policy of recognition of the right to national self-determination for blacks in the south. By adopting this policy as a rhetorical posture, the white-led Communist Party USA worked to better integrate blacks within their own movement and campaigns. By World War II, as Nelson explains with less clarity, many of these so-called leftists move on to more overtly imperialistic endeavors. (p. 164) Thus, songs about John Henry, once used by nominal dissidents like Seeger and Long for supposedly dissident purposes’ became part of the cultural cannon of the US’ burgeoning ‘multiracial’ empire. 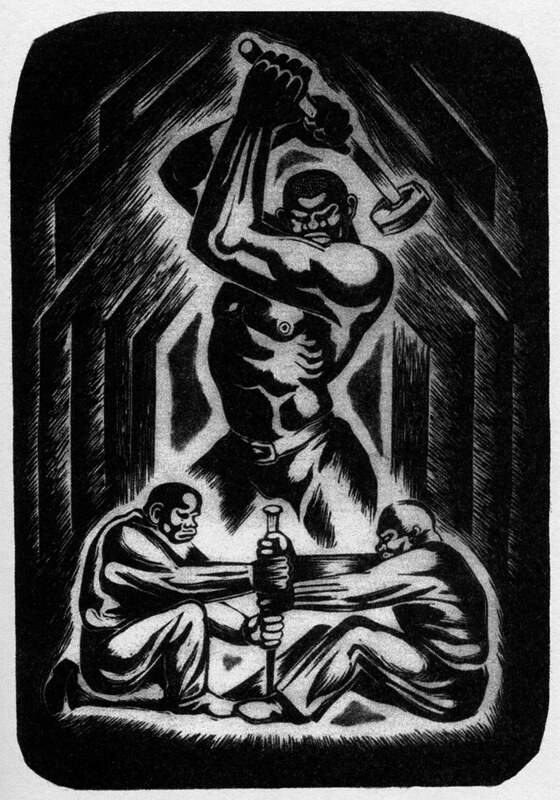 Nelson’s Steel Drivin’ Man is quick to place John Henry into the context of reconstruction and industrialization. Yet he often fails to put the story of reconstruction and industrialization into the context of figures like John Henry and the class he represented: young colonized men and women whose austere lives and exploited labor was a large part of the fire in the engine of US economic and social development during the period. While he paints a vivid picture regarding John Henry’s story and his own search to uncover it, what is left out is any truly critical history of the US and the economic relations it encompasses. Though Scott Reynolds Nelson’s work may find acclaim in the field of social history, such work is firmly outside the realm of oppositional discourse. Thus, the narrative he spins around John Henry explicitly reveals little of relevance for more deeper analysis of US history, the world capitalist-imperialist system, or the systems of oppression through which it is maintained.